I banked a few "general interest" posts last weekend, but now I don't need them. It seems whenever I write ahead, life presents me with "real time" things to write about. Today, I give you a round up of the mildly interesting things going on in my life, not necessarily presented in the order of interest. Recently, I purchased some new furniture for my house (condo). In my first apartment, in Seattle, when I was 17, I had almost no furniture at all and I liked it that way. It was a studio and there was a built-in bench and table in the kitchen. I had a rug and a single futon (on the floor) in the main room and a small dresser (my childhood dresser) in the closet. The stereo rested on a shelf built over the non-functioning radiator. I think I had one bookcase. My clothing was always fuzzy from sitting the sheddy rug, but that was the main drawback of no furniture. My college-age friends did not mind sitting on the floor. Now, I have sofas, a coffee table, bench, chair and a make-shift entertainment center in the living room. In the bedroom, I have a completely easy to dismantle platform bed with a regular mattress on top. I have a dresser and shelves of Danish modern design that I salvaged from a friend's house. I also have three tables. 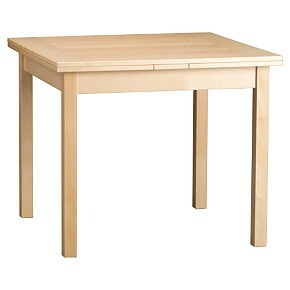 One is a very nice heavy duty card table. It folds up and can live in my backroom or basement. It has four matching folding chairs. I also have a kitchen table that I don't like much. It will have to go. The red in the picture is not true-to-life. The real life color is much more palatable. 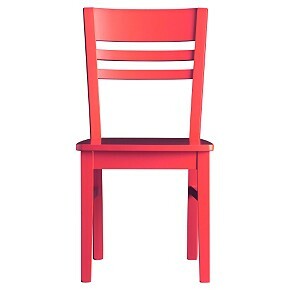 The reason for the red chairs? I'm cheap. They were half the price of the non-red chairs. It turns out that red chairs are pretty cool and look just fine in my place. They are comfortable too. The new table is awesome. It's very pretty in real life and has built-in leaves (they call it "self-storing"). Perhaps not surprisingly, both the table and chairs are Danish design. The table was actually made in Denmark. I have a thing for Scandanavian design. I'm a little hung up on Marimekko too. According to my dad, buying new furniture makes me a real grown up. No wonder I feel so old. My mom has been rather stressed out and depressed recently and I haven't been able to do much for her. The reason for her stress is that she bought a new condo and is selling her house. I've witnessed her handle this kind of transaction many times and I've never known her to have such a bad reaction. Usually, she just handles it. She's a good businesswoman with great instincts and she always does fine. She did fine this time, too, because she just called to let me know that she has a buyer for the house (at over the asking price). If all goes well, she'll be moving in June. That means I'll be going to Seattle around then to help. That's what good daughters do. I also told her about my new rowing opportunity. She was happy for me but, in classic mom style, also tried to put a damper on it. She asked, "When are you going to start?" "Next week. This week, I'm all booked up. Next week I can make three practices." "Well, when you are starting something like that, it's best to not do too much all at once." "I'll go on Monday. I have plans on Tuesday, so I won't go then. Then I'll go on Wednesday and Thursday. So I'll have a break in there." Ok, Mom. Please don't worry. I need to overdo it a little. But she does have confidence in me. I told her about my previous experience with this club and getting a seat in the boat because I'd proved my consistency. She said, "That's right. You're like me. You always show up. They like that." They do. And they always notice. Completely to my surprise, I received an email from Kyle yesterday. He was sweet, apologetic (but not too apologetic) and totally took my snippiness in stride. What he hasn't done is call or suggest making plans. I wrote back today (this time I made myself wait a day). I: 1) apologized (but not too much), 2) suggested we get together, and 3) gave him a couple of times to choose from. I still don't think this is going anywhere, but I'm giving it a chance.